Vijayawada, one of the most dynamic cities economically and culturally is fast growing to earn the honor of being known as the”Sporting Capital”. Sporting and outdoor activities are an integral part of any city in India since ages and Vijayawada has an enthusiastic crowd always up for an outdoor stint and sporting activities. Right from the common game of cricket to adventure sports like hiking and water sports people of Vijayawada are known to do it all. Cricket is the most popular game enjoyed by one and all in Vijayawada. Apart from cricket, people also enjoy indulging in Chess, Badminton and volleyball. The area around Vijayawada is famous for various adventure sports and outdoor activities. This includes hiking, fishing, boating and other water sports. The administration of Vijayawada realizes the importance of sports in the lives of the people. Hence they provide infrastructure for sports like lawn tennis, gymnasiums, swimming pool and shuttle badminton. Vijayawada Municipal Corporation has ensured quality arrangements for sporting activity throughout the city. They maintain three swimming pools one each at Chittinagar, Gandhinagar, and Gurunanak Colony. Apart from Indian Gandhi Stadium, Vijayawada has another outdoor stadium named Makineni Basavapunnaiah Municipal Corporation Stadium, and two indoor stadiums, Dandamudi Rajagopala Rao Indoor Stadium and Patamata Indoor Stadium, all maintained by Vijayawada Municipal Corporation. These stadiums are well provided for activities like hockey, table tennis and badminton. The Corporation uses the funds available under Basic Services for Urban Poor sub-mission of the Jawaharlal Nehru National Urban Renewal Mission for the upkeep of these facilities. 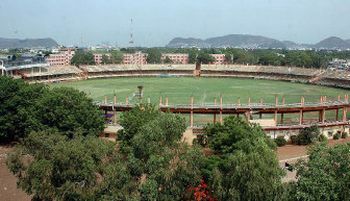 Vijayawada houses the famous Indira Gandhi Stadium which has hosted International level matches between India and West Indies in 2002. This outdoor stadium is maintained by Vijayawada Municipal Corporation. The stadium has witnessed innumerable matches of the Indian Premier League. A world class stadium is under construction in the Amaravathi Township in Mangalagiri and is being built over an area of 20 acre. This stadium is likely to play a crucial role in women’s cricket as Board of Control of Cricket in India has declared Andhra Cricket Association as the headquarters of Indian Women’s cricket. Koneru Humpy, world’s youngest Woman Grandmaster, who won the title in 2001, hails from Vijayawada. She has inspired millions of young brains in the city to follow her footsteps. Some of the personalities who have represented India in international and national level competitions are Lanka Ravi in Chess, P.V. Ramana and G. Pradeep in Volleyball, N. Madhukar in Cricket, Subbaiah Choudhary in Basketball, Ch.Lenin and M. Rishitha in Archery. The maximum number of personalities in badminton hail from the land of Vijayawada, namely Chetan Anand, P.V.V. Lakshmi, Neelima Choudhary, P.V. Saradha, Radhika Reddy and many more. My son needs training in badminton .can you people suggest is there any best academy? I am interested in kabaddi... May I know where it is trained? I'm interesterd in archery. Training institutes in ijayawada ??? Hi! You can visit the sports academy to learn boxing.